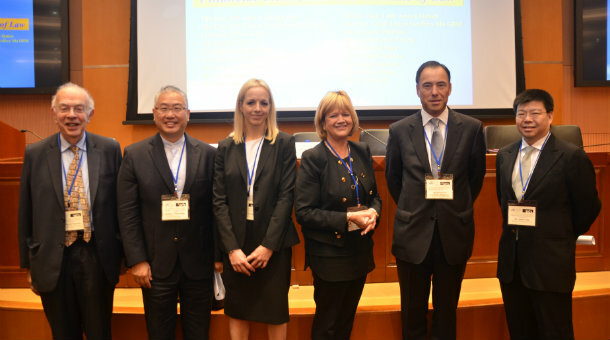 Held in Hong Kong on Monday 23 November 2015, the conference boasted a tremendous calibre of speakers, including The Hon. Chief Justice Geoffrey Ma, Hong Kong Court of Final Appeal, The Right Honourable Lady Justice Hallett DBE, Deputy President of the Criminal Division of the Court of Appeal of England, and UCL Laws alumnus Mr Justice Fok, Permanent Judge of the Hong Kong Court of Final Appeal. Together with the Vinson and Cissy Chu Charitable Foundation, UCL Laws alumnus Mr Winston Chu supported the series of Rule of Law Conferences in Beijing and Hong Kong, fostering a growing tripartite partnership between the great Law Schools of Hong Kong U, Peking U and UCL. Mr Chu also hosted a post-conference dinner for panellists and guests in Hong Kong. Conference and dinner participants also included UCL Professor Baron Lawrence Collins, former Justice of the UK Supreme Court and currently a Non-Permanent Judge of the Hong Kong Court of Final Appeal, Mr. Keith Yeung SC, Hong Kong Director of Public Prosecutions, and Professor Kai Xiao, Director of the Financial Crimes Division, Shanghai People’s Procuratorate. This conference follows the Rule of Law conference held in Beijing last week, where a five-year scholarship programme agreement between Peking University and UCL was formalised. The Vinson and Cissy Chu Charitable Foundation generously fund the scholarship. Read more about the scholarship here.